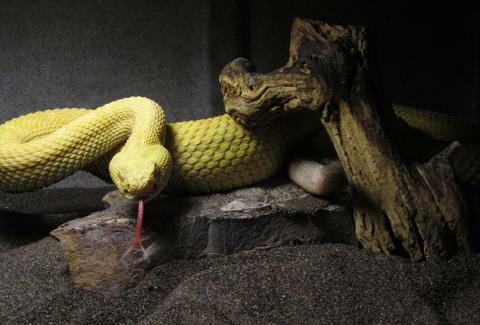 It's not uncommon for people to dislike snakes, which often stems from misconceptions about them being slimy, or dangerous, or overly pushy about giving naked chicks fruit. Helping shatter all of those myths, except maybe the one about them being incredibly dangerous: The Venomous Reptile Museum. Charlie: Known to be one of the deadliest venomous snakes in Thailand, Charlie's an albino monocled cobra, and a huge Whitesnake fan. Fang: This West African Gaboon viper, which can boast fangs up to two inches long, is known by its handlers to be "driven entirely by hunger", unlike social status and avant-garde European couture fashion like most snakes. Belle: A southern copperhead commonly found along the Southeastern Seaboard, Belle is a deft ambush hunter, although as a juvenile, likely lured prey in with her tail, before Chris Hanson walked into the room and said “I’m Chris Hanson”. Raja: VRM handlers say this king cobra is curious and confident in his cage, but nervous and shy out of it, likely due to the fact his venom has been removed, and he's constantly teased by other snakes about his e-reptile dysfunction. Beaker: Hailing from South Africa, this snouted cobra is the VRM's most docile resident and enjoys outings for reptile demonstrations and birthday parties, at which he's vigorously warned that the children are forbidden fruit.